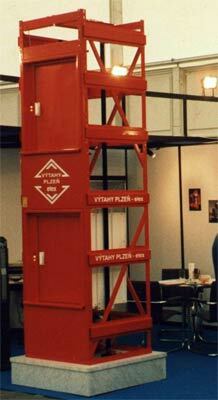 Hoists – Lifts, lifting platforms, lifts service – VÝTAHY PLZEŇ elex s.r.o. We manufacture and supply goods elevators both with traction and hydraulic drive with loading capacity from 50kg to 10t. 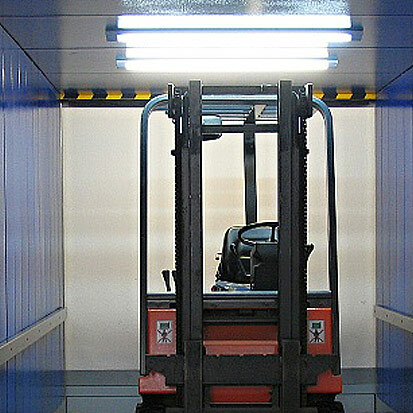 Machine room of such a lift can be placed over the shaft or beside it. In case of an elevator without machine room, the machine is in the lift shaft (see roomless lifts). Thanks to special lift cars, some goods elevators can also be used to transport people. Their cars have automatic rolling door, sash door, telescopic door, folding door (the bus type) or hand-operated door. The drives of lift machines are controlled by frequency converters with the effect of fluent ride, energy-savings and longer working life of the machine. The measurements of the lift types in following chart are provided just for rough orientation. We are ready to project and supply any traction or hydraulic lift of whatever size and implementation, speed and loading capacity.